Oprah's bringing her magic to Apple. As if Oprah Winfrey can become more successful, the famed and highly beloved talk show host, television producer and philanthropist has now teamed with Apple TV to release a plethora of new content and digital experiences. Oprah hit the stage at Apple's most recent seminar to detail some of the projects she plans to release with the company, specifically a live book club where subscribers can watch on-demand. "We need to be open in order to contribute and harness our hopes and dreams to hear our divisions," she said at the press event. "That's why I have joined forces with Apple. Because they're the company that has reimagined how we communicate. I joined in order to serve this moment because the Apple platform allows me to do what I do in a whole new way. Because they are in a billion pockets, y'all, a billion pockets. So I am honored and proud to be a part of this new platform to connect with people around the world to create positive change." Oprah revealed more information on the documentaries set to arrive. One's called "Toxic Labor" about workplace harassment while the second will cover mental health. 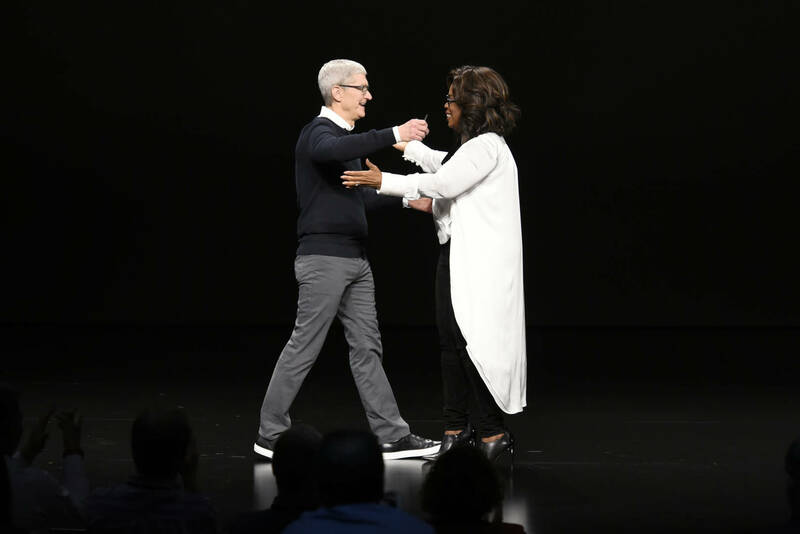 Apple CEO Tim Cook met Oprah on the stage where a few tears were shed. "Thank you Oprah, I will never forget this," he told her.